Grace Katz loves history, from the Pharaohs of Ancient Egypt to the 16th president of the United States, so it was fitting that on Presidents' Day, the 9-year-old Westport girl got to "meet" Abraham Lincoln in Fairfield. 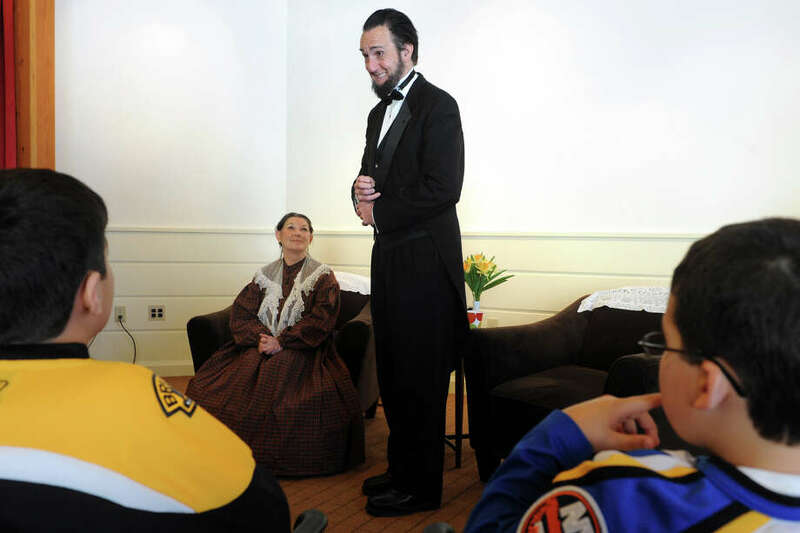 Lincoln, portrayed by actor Lewis Dube of Naugatuck, who studied at Yale's Drama School, and his wife Mary Todd Lincoln, as played by Civil War re-enactor Carol Deleppo of Harwinton, held a conversation over tea Monday at the Fairfield Museum and History Center. Their presentation covered little-known facts and interesting insights into the lives of the 19th-century president and his first lady. "I liked how they answered everybody's questions in their perspective, as if they were really Lincoln and Mary Todd Lincoln," Grace said. Staying in character most of the time, Dube and Deleppo shared with an audience of about 45 people some of the Lincoln family's history, including the deaths of several of their children, his presidency and assassination, Mary's privileged upbringing and widespread misconceptions about her. In the current, Oscar-nominated film, "Lincoln," "They portrayed this woman as being miserable all the time," Dube said as Lincoln. "Mother, were you miserable all the time?" he asked Deleppo as Mary. They were actually happy, he said, and Deleppo reinforced it. "We were very happy. My husband had just been re-elected and this crazy war was over," Deleppo said as Mary. People in the audience were invited to ask questions of President and Mrs. Lincoln. Grace asked about a dozen of them, eagerly listening to the answers. "What was the worst thing about slavery?" she asked. "No one should own another human being," Deleppo said as Mary. One child asked Dube if he knew the Gettysburg Address. Dube as Lincoln recited it: "Fourscore and seven years ago our fathers brought forth on this continent a new nation, conceived in liberty and dedicated to the proposition that all men are created equal ..." Then he explained that fourscore plus seven equals 87 years, which when subtracted from 1863 -- the year in which he delivered the address, would be 1776. "So he (Lincoln) was talking about the Declaration of Independence, the Fourth of July, the Birthday of the United States. The language is beautiful," Dube said. The adults in the audience were equally curious and captivated by the opportunity to "question" the Civil War-era president. Marcelle Conrad of Fairfield asked, "Do you think we would have come together as a nation if the North had lost the Civil War?" Dube, as Lincoln answered, "I think we would have ended up as four or five different nations," adding that at one time the Northeast wanted to secede from the union, as did the state of Rhode Island on its own. Freddy Lalama of Fairfield said he thought he would stump Dube with a question about how many top generals he went through during the Civil War, "but I didn't." The answer Dube gave was five. Lalama said he admired the real President Lincoln said his boldness as well as his motivation. "He wasn't well educated but he was self-educated and became a lawyer and the president of the United States," Lalama said. John McNamara of Fairfield brought his three children -- Cate, 8; John, 6, and Erin, 4 -- to the museum Monday because "I wanted to have our kids become more familiar with our country's history and Lincoln's legacy. It's important because they need to understand and appreciate what our country stands for and the road that it's taken over the years." "I really like how he (Lincoln) was against slavery. I know it was wrong and he's one of our greatest presidents," Grace Katz said. Walter D. Matis, the museum's program and volunteer coordinator, said Monday's event was a successful match for the holiday. He said Dube and Deleppo brought a personal connection to the Lincolns. "Abraham Lincoln is a stoic figure to most people," Matis said, but he and his wife were real people with real lives and that was conveyed by the re-enactors. "In a sense we were in their living room," Matis said. Grace Gianquinto, 8, of Bethany, said she liked "learning about Lincoln's life and seeing his artifacts." On display at the museum is one of 26 known remaining original Emancipation Proclamation documents and the pen Lincoln used to sign it. Because of the recent snow storm that paralyzed the state, the exhibit will be extended to March 1.